I love when someone grabs onto a design concept and runs with it. 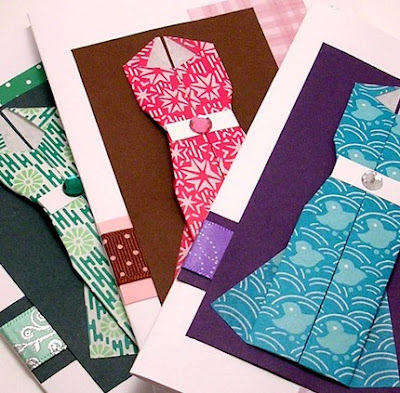 Tina of Etsy shop KittyKatKards, is one of those people... she makes multitudes of the cutest origami dress cards. 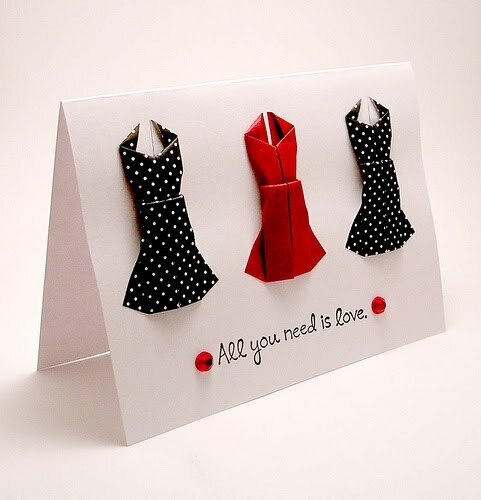 Crisp, clean lines, paper 'fabrics', as well as quirky little sayings.... it all adds up to eye-catching fun. Tina was a child when her mother started her on the path to origami folding. She was shown how to do a few models and searched out more. The folded dress that's been such a fantastic seller is a design Tina discovered at OrigamiClub. She liked its girliness and thought it could be used for many different types of cards, and also as a scrapbook embellishment. Tina says she's always liked the idea of card making, but only seriously got into it the past couple of years. 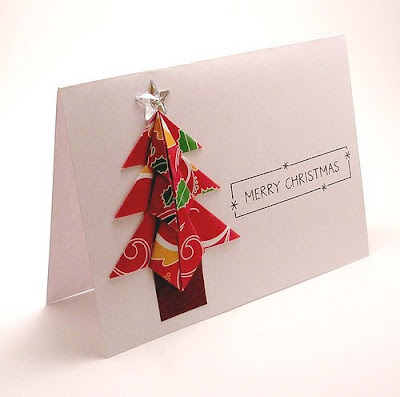 She also enjoys photography and has offered a few photo cards in her shop, but mainly focuses on paper folding. 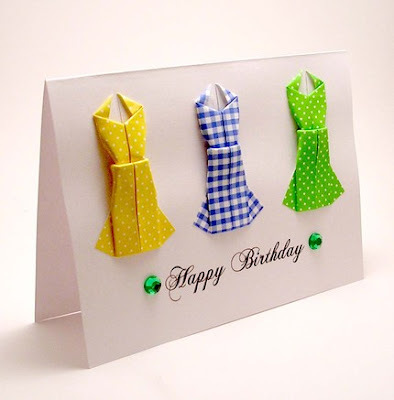 Not all of her origami cards feature dresses however; look for stylish seasonal designs, too, at KittyKatKards. I love how the pattern on the paper total changes how the style of the dress appears- even though the origami stays the same! You got me at the Christmas tree! Thank you Ann, for the introduction to this talented lady. I will be linking toher closer to the holidays. Just LOVE that tree card. LOVE IT! 'All you need is love"... and a few dresses! (On cards that is.) These are awesome! These are fantastic! Never seen anything like it before - great ideas... Really got me thinking about how else this style could be used!